How to make cushions, some help and instructions. Wondering how to make cushions can seem quite daunting. Some can be made in a very simple, basic way and can be a good way to learn how to start sewing, getting used to a sewing machine and getting used to the basic stitches. This can lead to more complicated sewing, putting in zips, sewing gussets and different shapes. Before you know it you will be onto making clothes. The one part I love about sewing is that you are the designer, there are no hard and fast rules. If it is how you like it then perfect. Enjoy and experiment with the lovely fabrics, fastenings but most of all have fun. When making this site first came into being and many pages of information had to be written about our chosen topic, I froze. What could I say about these great soft furnishings? I thought I could reach about 20 pages if that but then after I had really thought about it, there is quite a lot that needs to be decided and there are some that I have stretched the cushion theme but they all are padded items. There are a few considerations to think about such as what room is the cushion for? Does it need to be hard wearing? This will then give the question of what type of fabric to use. It can feel like a never ending list but once these have been made the sewing process will flow. How to make cushions..the decisions to make at the start. Different items like a frill can be added which can be a single or double one using the same or contrasting fabric or one of each. Making a gusset will give depth and are usually used when making seating for outside chairs or chair bases.These are called box cushions. Who said the shape has to be square experiment by trying different ones and see how far you can stretch your imagination and your fabrics. Some shapes are great for supporting the small of your back or the back of your neck. Fastenings can be hard to fix into place and practising will make it easier. Sometimes fastenings are also used as decoration. There is one cover that has no fastenings at all. These can be made by using a lot of different fabrics and made in traditional patchwork patterns or experiment on your own patterns. Other decorations such as embroidery, cross stitch or appliqué turns the simple cushion into a complex decorative addition to compliment any room. Not all cushions are the same but they all help in our lives, where would we be without a soft knee protector when kneeling on hard surfaces. Some have jobs to do and help around the house and garden. While others hide a quilt inside that can be used as an extra cover when the temperature falls. This could be while camping, travelling or sitting watching television. Many handicrafts and sewing crafts produce lovely cushions. 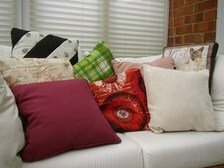 This type of soft furnishing are known as pillows in some parts of the world. They both are used in the same way as a decoration for your room or for added comfort while sitting. There is such a lot of lovely fabrics available in lots of different colours and designs to suit most homes. There are many outlets such as Laura Ashley and Minerva Crafts as well as a few more on my shopping page. There is a lot of scope for your imagination in all aspects of sewing so have fun and enjoy.